Anyway, lets take a look on what is new and different in the 3D Vision Pro glasses as compared to the normal 3D Vision glasses that you can also currently use with Quadro or GeForce GPUs. First of all the infrared (IR) transmitter is now gone with all its negative sides and is being replaced by a radio frequency (RF) communication system. This removes the need of having a direct line of sight between the glasses and the transmitter and should also get rid of any interferences with other infrared devices that might cause an annoying flicker of the shutters. The RF communication is also not a single way one like with the IR transmitter just sending a synchronization signal, but it is now two way communication that allows the glasses not only to receive the sync signal from the PC, but also to report their status to the computer. The RF communication should also allow more problem free use of multiple 3D Vision Pro equipped systems packed in smaller spaces and should also allow increased range of up to about 30-45 meters (100-150 feet). The drawback coming from that change in communication (the most likely reason) is that the battery life you get with a single charge is halved – from 40 hours with IR to 20 hours with RF, but that should not be such an issue for most people… these are still rechargeable batteries. And now the not so attractive part – the pricing, which is a bit high, but considering this is a professional product the higher price is expected, however a consumer implementation should be much more affordable. 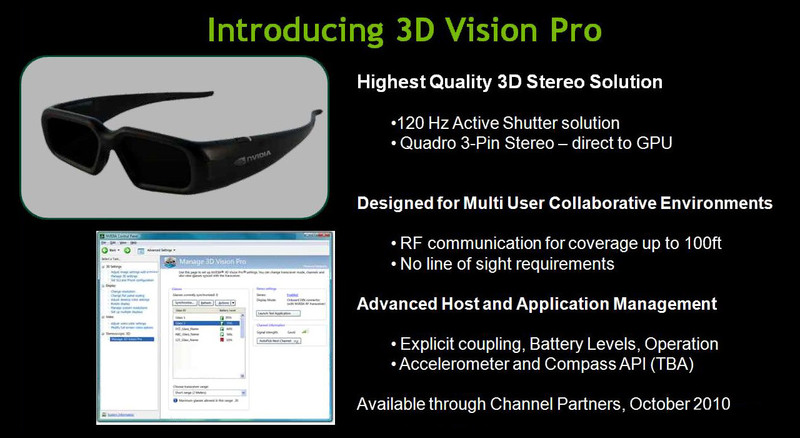 So the Nvidia 3D Vision Pro stereoscopic solutions will be available in October directly from Nvidia and from authorized resellers such as PNY Technologies with a recommended price of $349 USD for the shutter glasses, and $399 USD for the RF transmitter hub. Do i need to buy new glasses for this because i already own Quadro FX 3800? If the price is about the same as the current glass’s costs, and there are experiance improvements, i will deffently buy them. Will a different Glass design be able to reduce ghosting? Or is the only way to reduce ghosting, thru the Monitor? Thomasjn, so far this is only for professional Quadro users, not for end users or gamers, but we may see an updated version introduced for them too. Apparently there are some improvements that can help get better results, and glasses can as well help in reducing some of the ghosting a bit, but it is not only up to the glasses. Do you guys think, there will be a “3D Vision 2” for normal user SOON?! Because I am considering in buying the “old” glasses. Does the newsten driver still don´t surport DirectX 11 games in 3D Mode? If I have two digital cameras that are simultaneously imaging a scene at and angle to each other, how do I have the images overlayed and synced with the LCD glasses so the images appear to be 3 D? Whuh? Supposing I have more than one 3D vision setup in a room (as a “pro” very well might) – will there be any problem as to which pair of glasses syncs to which monitor? I just was at the Siggraph NVidia booth and I should say..
3D-Vision pro is NOT just for Quadros, It works on all 3d-vision capable cards. Nvidias marketing is a bit confusing right now on the issue. But if you go here nvidia’s 3d-vision pro requirements you’ll see a link to -> Click here for a list of compatible NVIDIA® GeForce® cards. RF is great.. The glasses I tried were of the same quality and feed of the original 3d-vision glasses. Crystal Cowboy, it should be problem free thanks to the RF communication, unlike with IR when you might have trouble with such setups, but not depending on the setup you might not have trouble even with IR glasses. MotoMatt, well I saw a presentation saying that the Pro glasses are just for Quadro, however there is the link you point out, but it is pointing to the normal 3D Vision requirements page, not the pro. I asked the Nvidia project manager point-blank if 3D-Vision pro worked on non-Quadro cards and he said yes.. And then I had him verify it with another nvidia member. I think the confusion is the announcement came as a way to pump up the new Quadro video-card line which was just launched. 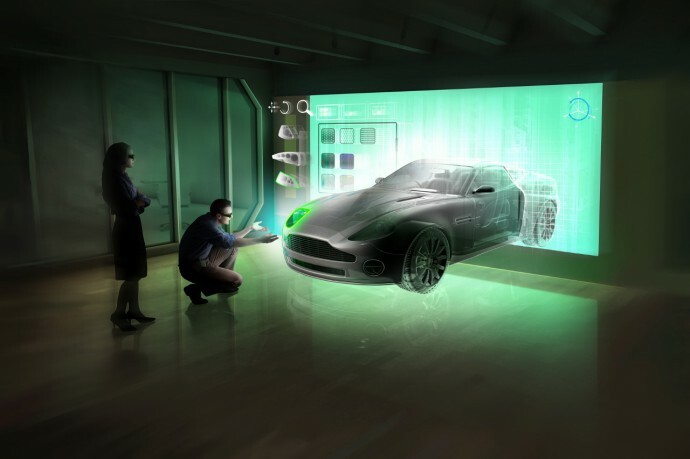 They are attaching the marketing push to the 3d-vision pro platform.. I sure hope i’m right on this one because I just invested in 3 gtx480s! Will there soon be official Nvidia drivers/suport to use the Pro version with larger LCD/LED TVs connected to a Quadro computer? Here’s verification that 3D-Vision Pro IS compatible with all NVidia cards.